I'm a huge fan of Terra Elan McVoy's writing. She writes really great novels about friendship and love and has gorgeous bright covers that are very eye-catching. 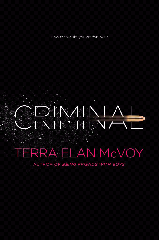 Today she revealed the title and summary of her next release, Criminal! Criminal, as you can see by the cover, is a little edgier than her last books. What do you think? I like the black, and I absolutely love the bullet splicing the title--very dangerous! Go check out terraelan.com to learn more! I think it's a great cover! I love that her covers are more minimalist and to the point. Ooo--the cover is definitely creepy...in a good way! I'm actually not fussed by the cover. It may grow on me. I like the bullet slicing the title! Not too sure about the hot pink, though. Based off of her other covers this one fits well. I think the font could have been a bit bigger or bolder. I like the bullet. Read the summary on Goodreads. Sounds interesting but I'm not sure how it could possibly end happy?